Liverpool returned to winning ways after two consecutive Premier League draws, dominating from start to finish in a comfortable 3-0 win at home to Bournemouth. The in-form Sadio Mane got the ball rolling midway through the first half, heading home a James Milner cross to score in a fourth straight league game for the first time in his career. Georginio Wijnaldum doubled the lead 10 minutes later, controlling an Andy Robertson pass before lobbing delightfully over Artur Boruc. A hungry Mo Salah completed the scoring early in the second half, curling the ball home at the end of a brilliant team move. Bournemouth will enjoy better days, while the Reds temporarily returned to the top of the table – at least until Manchester City destroyed Chelsea some 24 hours later. Jurgen Klopp set Liverpool up in a 4-3-3 formation in possession; Fabinho, Georginio Wijnaldum and Naby Keita comprised the midfield, while Sadio Mane, Mo Salah and Roberto Firmino formed the front three. The Reds looked to dominate possession, and were once again tasked with breaking down opposition that set up in a mid-low block. With central areas congested, Liverpool looked to use the half-spaces and wide areas to penetrate the Bournemouth block. 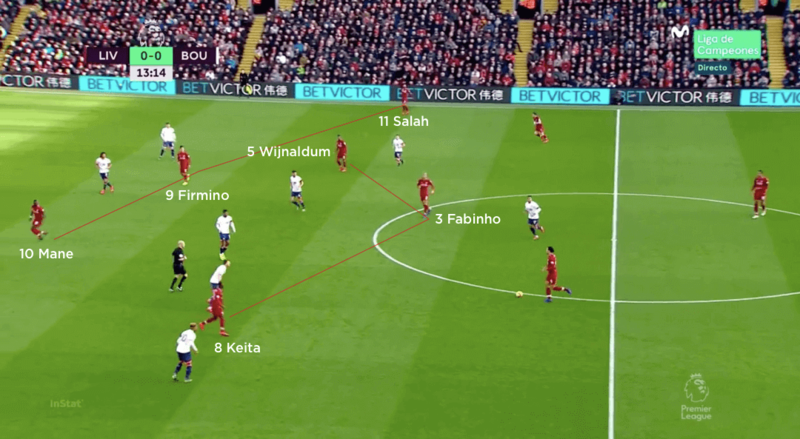 They dropped Keita deep to get on the ball, drive forward and commit the visitors’ midfield before switching the ball to Fabinho or Wijnaldum, who could progress the attack. The relationship between wide attacker, outside central midfielder and full-back on each side was important, and their movements in relation to each other were well co-ordinated. 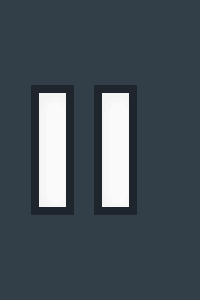 On the right, Salah drifted wide, with right-back James Milner staying deeper and Wijnaldum looking to run in behind. 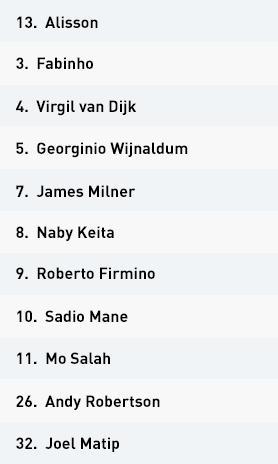 On the left, Keita and Robertson would look to advance beyond the Bournemouth midfield line when Virgil van Dijk had the ball, with Mane dropping in. 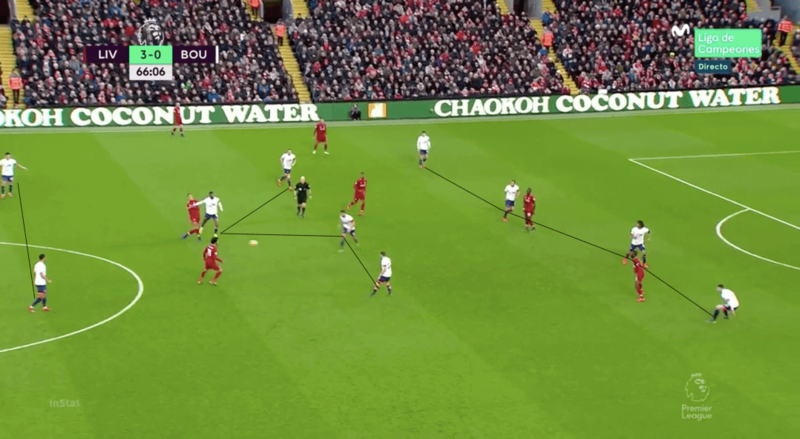 The key here was that the Bournemouth midfield would be set up to screen the pass into Keita, leaving Mane free to drop on to a different vertical line with a passing lane to the man on the ball, making him available to receive between the lines. On other occasions, Liverpool would keep their full-backs in front of the Bournemouth unit and use them to entice Bournemouth into a press. 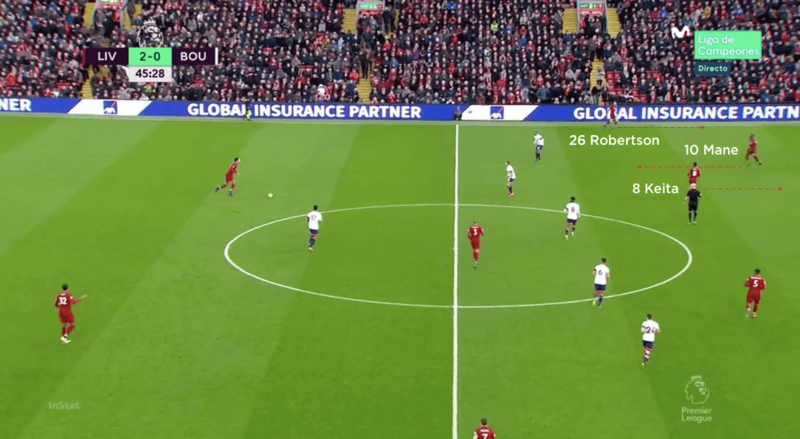 As the ball went to Milner or Andy Robertson, Ryan Fraser or Jordon Ibe would press, with Fabinho moving nearby to support. The Brazilian was immediately pressed by Dan Gosling or Andrew Surman, but would look to play the ball wide to Salah or Mane free of the screening that Fraser or Ibe would otherwise have provided. 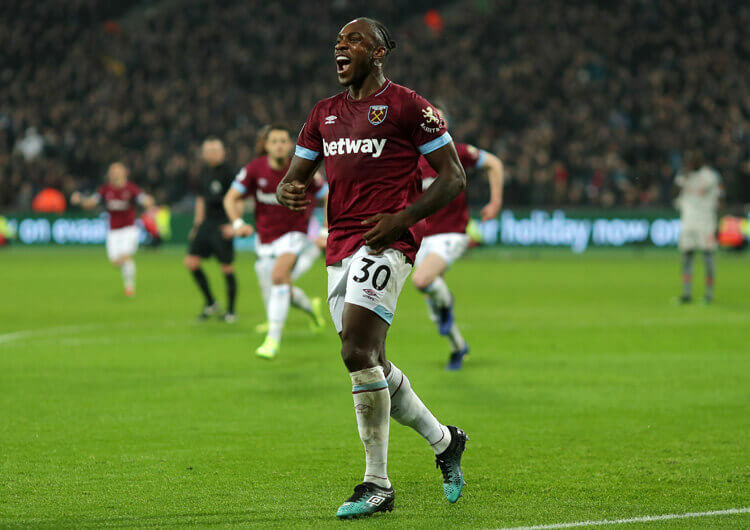 From there, Liverpool’s wide attackers could combine with Wijnaldum or Keita beyond the midfield line – it was from one such forward run that the former scored Liverpool’s second goal.  Out of possession, the hosts looked to initiate a high and intense press on Bournemouth at every opportunity, in an attempt to disrupt their short build and regain possession close to the goal. Salah and Mane typically pressed centre-backs Nathan Ake and Steve Cook, with Roberto Firmino dropping on to single pivot Jefferson Lerma. Wijnaldum and Keita looked after Surman and Gosling, leaving Fabinho to operate in front of centre-backs Van Dijk and Joel Matip, who shared responsibility for Josh King. Robertson and Milner tracked Ibe and Fraser, which left full-backs Adam Smith and Diego Rico free. If they stayed deeper, then Mane and Salah would continue their press from centre-back on to full-back. 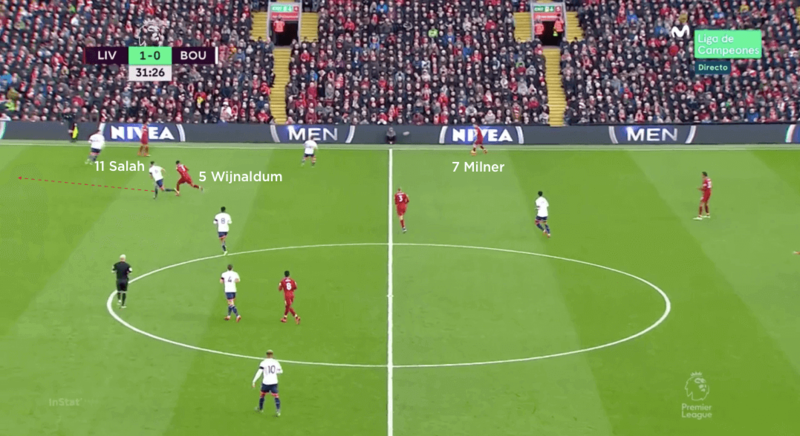 If they moved higher, then the central midfielder on that side – Keita or Wijnaldum – would move out to press them, with Fabinho moving across to cover the Bournemouth midfielder who had been left. Over the 90 minutes, Liverpool regularly regained possession in the early stages of Bournemouth’s build, or forced errors that disrupted the visitors from ever securing a genuine hold on the game. Liverpool used a 4-3-3 formation in possession. 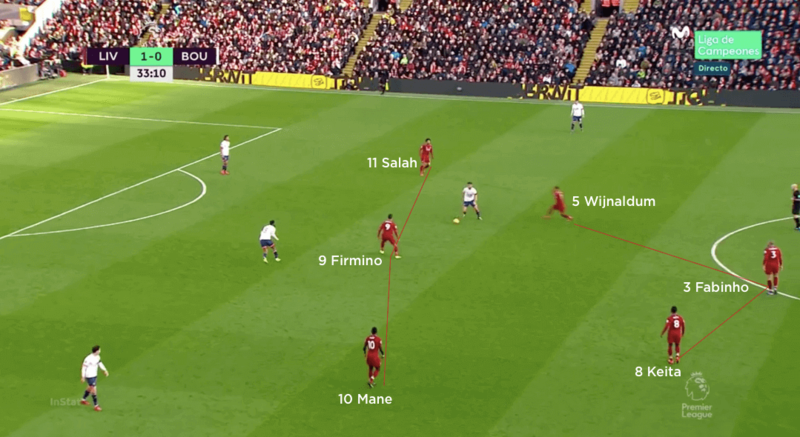 Fabinho operated as the deepest-lying of the midfield three, while Mo Salah and Sadio Mane supported Roberto Firmino from wide areas. The Reds pressed in the same 4-3-3 shape, and worked hard to win possession as high up the pitch as they could. On their right flank, the hosts used the relationship between James Milner, Georginio Wijnaldum and Salah to play through Bournemouth regularly. On the left, Liverpool used Robertson, Keita and Mane to break Bournemouth down. The Cherries’ midfield unit would be in position to screen Keita and affect Robertson, leaving Mane free to drop on to a different vertical line and offer a passing lane for the man on the ball. Bournemouth used a 4-3-3 formation in possession, with Jordon Ibe and Ryan Fraser supporting central striker Josh King from wide areas. 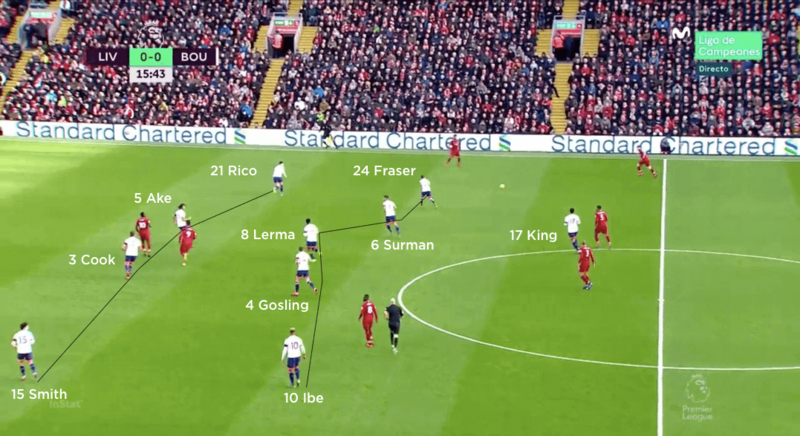 Out of possession, the visitors shifted to a 4-5-1 shape, with Ibe and Fraser dropping alongside the central midfield trio to form a midfield line of five. Bournemouth switched to a 4-4-2 in the second half, with Dominic Solanke replacing Ibe and playing up alongside King. Having Solanke higher up with King gave the Cherries an extra man to break with should they regain possession and get on the counter-attack. The extra man also gave King someone nearby to combine with when the ball was played into his feet. Eddie Howe set Bournemouth up in a 4-3-3 formation in possession, with Jefferson Lerma, Dan Gosling and Andrew Surman as a midfield three behind Jordon Ibe, Ryan Fraser and central striker Josh King. The visitors enjoyed limited possession in the first half, and struggled to maintain any good possession before losing the ball. When they did attack, Fraser would often look to drop towards the ball on the left, with Surman and left-back Diego Rico looking to advance beyond him. Lone forward King would look to receive to feet or run into channels to chase passes in behind, while on other occasions Bournemouth would look to find Ibe’s feet for him to dribble inside – although the former Liverpool winger struggled to have any real impact against a well-organised Reds defence. Early in the second half, Bournemouth brought on another former Liverpool man, Dominic Solanke, for Ibe and switched to a 4-4-2 both in and out of possession. 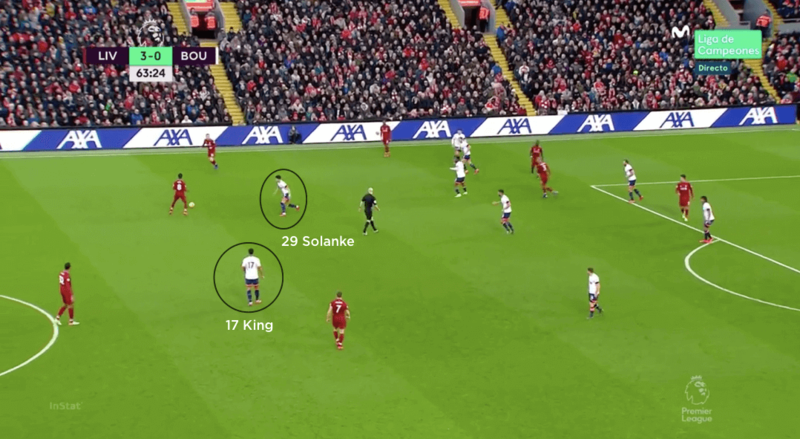 The impact of this in possession was that, when Bournemouth countered, they would have two players ahead of the ball rather than just King – who had previously been shown away from goal while Liverpool recovered. Equally, when they played into King’s feet, he would have someone nearby to combine with and keep the move going while supporting runners joined from deep. 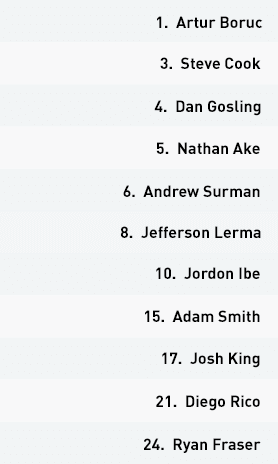 Out of possession, the Cherries used a 4-5-1 formation in which Fraser and Ibe tucked in alongside Gosling, Lerma and Surman to form a midfield line of five. 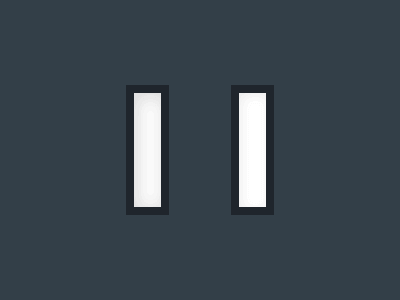 They utilised a mid-low block, with the halfway line as their line of engagement. King would impose a very mild press on the Liverpool centre-backs but was more concerned with screening Fabinho. 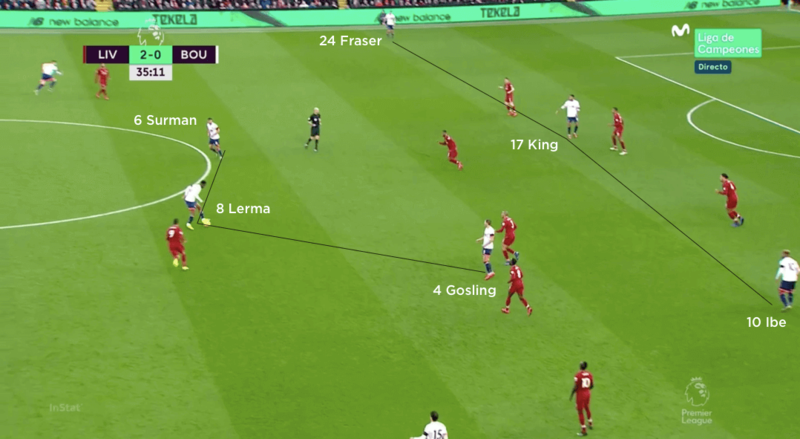 Surman and Gosling held their position in the midfield line, while Fraser and Ibe moved out to close down Robertson and Milner when the Liverpool full-backs were in possession. This press lacked intensity, though, and was geared towards preventing forward play rather than closing down to tackle. When the ball entered Bournemouth’s half, they would look to get up to the man on the ball. 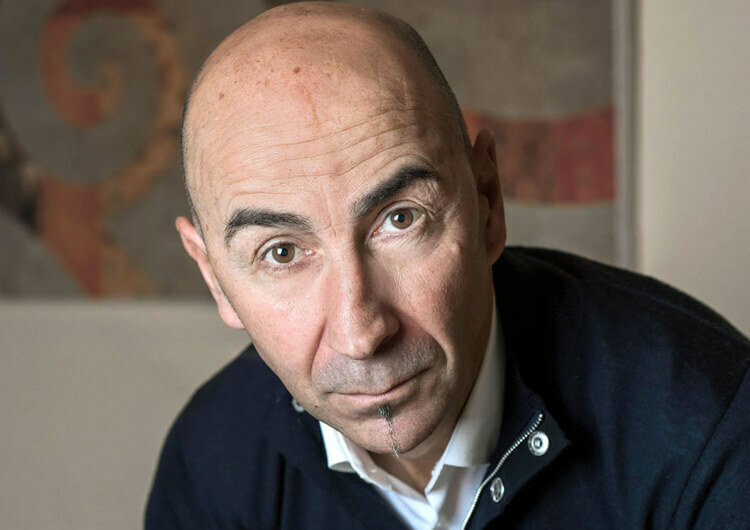 Gosling closed down Keita, Surman closed down Wijnaldum, and Lerma would stay between the two while King dropped back to affect Fabinho. 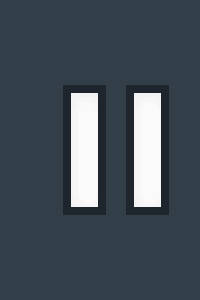 When Salah or Mane drifted wide and received the ball, their opposing full-back would press them while the wide attacker tracked back to cover them inside. When Bournemouth switched to a 4-4-2, they used Solanke and King ahead of the midfield unit. 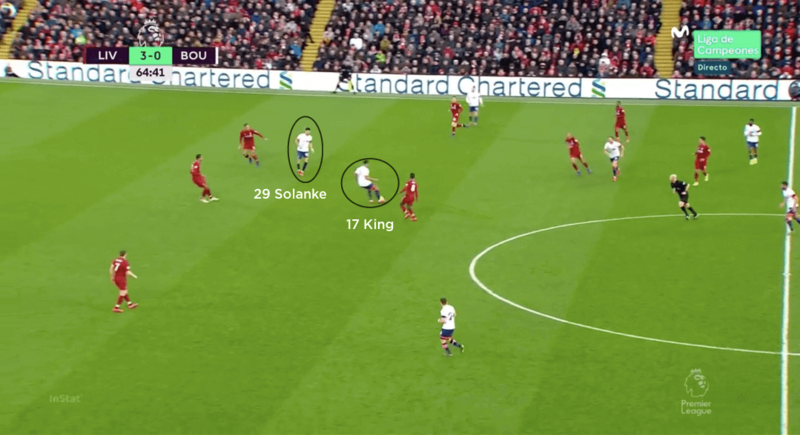 Solanke typically took on the job of marking Fabinho while the midfield four formed a compact, narrow line in order to negate any central overload that Liverpool may try to create through dropping their forwards or advancing their midfielders. This conceded space in the wide areas, which Bournemouth were happy to do – they would then move out to press the Liverpool full-backs, but were also happy to defend any crosses coming in. 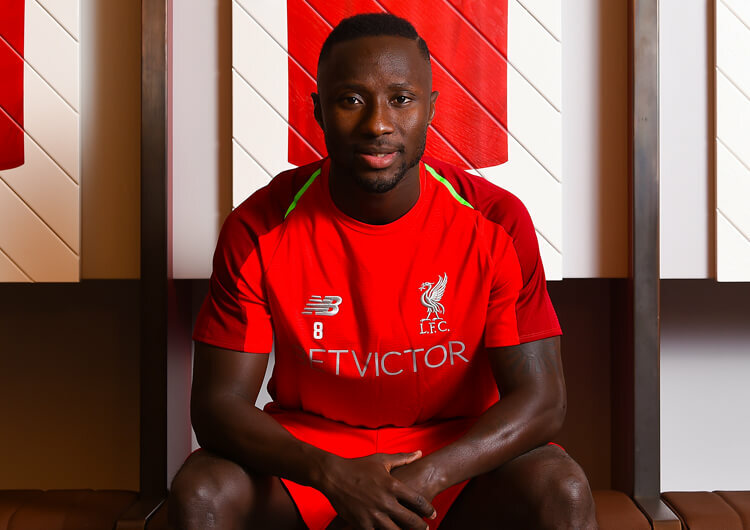 The defensive dynamism of N’Golo Kante but with an attacking edge to match – can Naby Keita be the final piece in the jigsaw as Jurgen Klopp and Liverpool launch a serious assault on the Premier League?